Compared with most other BCN walks, this one starts from very quiet rural surroundings at Pelsall Junction where the Cannock Extension Canal leaves the Wyrley and Essington. It wasn't always like this, on the other side of the canal from the common stood the belching chimneys of Pelsall Ironworks (1832 -c.1892) which a long with many others industries developed in this mineral rich area following the arrival of the canal. There's an initial straight section on this otherwise meandering canal up to Pelsall Works Bridge built by Horseley in1824. Now starting to curl it's way towards Walsall, and just around the corner Lord Hay's Branch left to service his lordships mines and quarries, it was abandoned in 1954. Although open, the countryside still still bear the marks of their coal mining past, but there are green farmers' fields and even a farmhouse near Freeth's Bridge. Look a bit further and the real world comes into view in the form of two tower blocks. Housing kicks in a little further on when you reach Teece's Bridge and there's a proper towpath to make walking easier. After sliding unnoticed through Little Bromwich, the canal goes through the back gardens of lines of houses some of which have placed chairs and benches to see the odd boat go by. The canal widens towards Hollands Bridge, it's on an embankment due to local subsidence, but there's not much to write home about until you pass allotments before Goscote Works Bridge and then a trailer park. The area has a long industrial history. In the late 1800s Goscote Iron Works stood up the road on the towpath side and on the far side of the bridge there was a boiler works and Goscote Old Collieryf. What's left is a very large derelict site where, a little further on behind an impressive brick wall, once stood a huge copper refinery owned by Elkingtons, the famous Birmingham firm of electroplaters on the other side of Slakey Lane to Goscote Hospital. On the towpath side there's again open country but don't look too hard as there's also a sewage works. Smart new housing appears before Coalpool Bridge, still with an expanse of green opposite. But soon you're back walking through housing with only metal and concrete fencing either side to protect you. 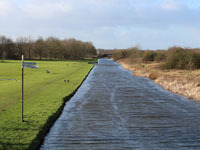 Under a footbridge and over a railway aqueduct, the more observant walker will note that the canal originally followed a more circuitous path before the railway arrived. The landscape is now decidedly urban with more development after Pratt's Mill Bridge and onward passing the former Birchills Hall or Staffordshire Iron Works. Walsall's earliest blast furnace was established here in 1803. It is now a very large TK Maxx warehouse. A little further on is Birchills Junction adjacent to which were the power stations that served Walsall from 1916 to 1982, the original one had all its coal delivered by canal and their cooling towers relied on water from the canal. It would be good to say something nice about this stretch but even the towpath graffiti is half hearted, although there is a useful map painted under Stokes Bridge. Sneyd Narrows, Wharf and Junction provide some interest on this fairly pleasant section but the rumble of traffic builds as the M6 is approached. By the time Roughwood Narrows and Bentley Wharf Bridge are reached the road noise has diminished and there's a nature reserve. Adjacent houses engage the canal up to Lane Head Bridge where refreshment can be had at 'The Bridge' or the 'United Kingdom' or both. At Holly Bank Basin and the Short Heath Branch there is a much more urban feel but then greenery returns and there's really nothing of note, except for the bright red Devils Elbow Bridge, as the canal passes through neat housing on its way to Wednesfield Visitor Moorings and the Dog and Partridge. Passing the rather odd Trap Makers Bridge, you reach the Bentley Bridge Retail Park at Wednesfield Junction where the Bentley Canal should be. Opened in 1843 and closed in 1961, this canal was built after the W&E amalgamated with the BCN and ran to the Anson Branch of the Walsall Canal. After the junction, housing returns to each side of the canal. The manicured landscape is all very pleasant and there's even some modern art at the disused Heath Town Railway Bridge. Factories and scrap yards take over up to Lycetts Basin and the Horseley Toll Stop, before going under the railway and on to the Birmingham Main Line at Horseley Fields Junction, a location which will never win any awards from the British Tourist Board. The W&E is a fairly clean, well kept canal but it lacks personality, the Honda Accord of canals. Not having locks doesn't help, parts are pleasantly rural but then for much of the time you are walking through nondescript housing estates.